He's Just Not That Into You: So here's an awesome rental... if you hate yourself. Defiance: Edward Zwick's WWII action epic has some good sequences but a hollow center; it's worth a rent, but that's about it. Revolutionary Road: I've read everything from best-of-the-year praise to fierce pans of Sam Mendes' portrait of a marriage on the edge; I was kind of in the middle on it. Like Mendes' previous picture, Jarhead, I was impressed with the technique but failed to be emotionally engaged the way I was by his American Beauty or Road to Perdition. Spring Breakdown: Sometimes a good movie will slip through the cracks and go straight to DVD, and you'll wonder why. More often than not, though, it's easy to see why a movie went straight into the home market, and unfortunately, this goofy girl comedy (with a talented cast that includes Amy Poehler, Parker Posey, and Jane Lynch) doesn't bring the funny. Eddie Murphy: Delirious- 25th Anniversary Edition: This was Eddie's finest hour as a stand-up comic, and it's worth revisiting on the eve of (shudder) Imagine That, as yet one more reminder of how the mighty have fallen. Out of Time: Carl Franklin's 2003 suspense thriller didn't scare up much business (in spite of the presence of Denzel Washington in the leading role), and most critics missed the boat entirely (though a couple latched on). It's out on Blu-ray this week and due for a fresh look; it's a sleek, crackerjack thriller that's full of kicks. Anaconda: Also new on Blu this week: one of the great bad movies of all time. 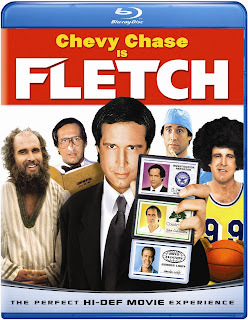 Fletch: And the greatest movie Chevy Chase ever made hits high-def as well. I already bought this twice, so I probably won't be springing again, but let me tell you one thing: there are few things in this world I would rather do than watch Fletch. Period.